Ladies and Gentlemen, please take out your iPads. You don’t have one? Borrow one. Quickly, please. 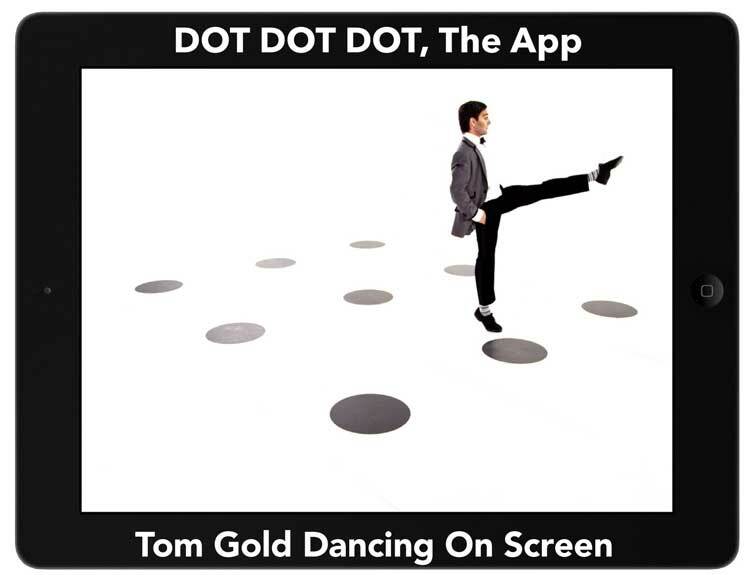 Now, welcome to the screen world of DOT DOT DOT, a dance in the form of an app starring Tom Gold, who appears, multiplies and disappears with the tap of your finger. In other words, Tom, as choreographer and dancer, is at your command. Can you see Tom appear among the nine giant black dots arranged on the white floor? No? Touch one of the black dots, and Tom jumps out and the dot almost always turns orange. Touch another, and another until you have nine different Toms jumping and turning simultaneously. With the camera perched high above, the effect is pure Busby Berkley. By swiping up, the giant dots turn into tall black columns around which Tom dances. The camera is static. Vertical swipes create different landscapes, while lateral swipes create alternate sequences. Performing to an original, vibrant violin score by Charles Yang, Tom is engaging, witty, charming, and an extraordinary dancer jumping, turning, spinning, sliding, tapping, appearing, disappearing between, behind and among the columns, playing hide and go seek with you, the viewer. Swipe again, and the camera now pans close up revealing a far distant Tom dancing among the columns. Then swipe again, sit back to enjoy a full, three minute dance that Tom, a former New York City Ballet soloist and now head of his own ballet company, created especially for the iPad. Once again dancing among, upon and between the dots, but now with greater authority and complexity until he waves good-bye and disappears, this time on his own accord. Advances in technology made possible the greater sophistication of “Fifth Wall,” 2wice’s second app, which was released last June. With choreographer/dancer Jonah Bokaer performing inside a specially created box scaled to the dimensions of the iPad screen, the dance could be reframed in multiple ways by its viewer, giving the illusion of multiple dances taking place simultaneously, or one dance with multiple points of view. Viewers can shift the sequence of events, eliminate or add images. Another jump in technology allowed “DOT DOT DOT” to incorporate scenic changes and the multiplication of the same image in different spaces. “Fifth Wall” and “DOT DOT DOT” are both available through the App Store for the iPad for $.99. PATSY TARR is the Founder and President of the 2wice Arts Foundation. She currently serves as the Producer of all 2wice Apps. Past affiliations: Board member of the Nikolais/Louis Foundation, David Gordon Pickup Company, Trisha Brown Dance Company, Dance Theater Workshop, Founder and President Dance Ink Foundation, Cunningham Dance Foundation, The Film Society of Lincoln Center. Current affiliations: Vice Chair Chez Bushwick, Trustee, Fondazione Bogliasco, Trustee, Central Park Conservancy. ABBOTT MILLER is a designer and art director, and a partner in the international design studio Pentagram. He has served as Editor and Art Director of 2wice since its inception, collaborating with leading choreographers and photographers on this unique performing and visual arts publication. Prior to 2wice he served as designer of the award-winning quarterly Dance Ink. A retrospective of his design work for 2wice and Dance Ink was held at the American Institute of Graphic Arts in 2010. He studied at the Cooper Union in New York and later founded the multidisciplinary studio Design/ Writing/Research. Abbott has received numerous honors, including medals from the Society for Publication Designers and three nominations for National Magazine Awards. His work and critical writing has appeared in Eye, Print, I.D. and other publications, and he is the co-author of four books, including the classic Design/Writing/Research: Writing on Graphic Design. A survey of his design work, Abbott Miller: Design and Content, is published by Princeton Architectural Press. York City Ballet and Orlando Ballet. Future projects include three new works for his second New York City season, and a summer tour in Spain. BEN LOUIS NICHOLAS is a filmmaker based in NYC. He studied at NYU’s Tisch Film School with a concentration in directing and cinematography. His work with 2wice Arts Foundation and Pentagram began in 2011 with the Merce Cunningham Event iPad app. In 2012, he collaborated with the same team and international choreographer Jonah Bokaer toward the making of their second app Fifth Wall. Outside of iPad apps, Ben has directed numerous commercials and music videos. He’s also co-founder of The New Heroes, an art zine he publishes with his brother Thomas Nicholas.